If it were about the cat, it would be, as other reviewers commented, a pleasant, albeit sometimes slow-paced, story. It's not even about the main character, Saturo, who is less than three-dimensional (his characteristics are generosity and joy at life, with no realistic negatives) and who seems to get lost into his friends. [For each, in different stages in his life, he switched interests (swimming, farming) or gave up a woman for the sake of his friend.] Other than these friends and his aunt, we learn little about him. But it is about unconditional love. Unconditional love exists between Saturo and his cat, Nana. The story only makes sense as adult fare when you recognize the two of them as both ends of a metaphor. Saturo has offered unconditional love to his friends. When he travels to visit them hoping to find a home for his cat, he finds they are limited, and would not be able to provide a good home for Nana. Yet, each has an animal who might lead them to unconditional love. In the fourth chapter (titled "3½: Between Friends"), Saturo and Nana share the 22 experiences (listed on page 245) that express Nana's happiness. "...you don't find such incredible love very often. That’s why I’m so happy." The second to the last chapter (titled: "4: How Noriko Learns To Love") is not talking about any love. Noriko goes from acting out of guilt and duty, to unconditional love. So why bother with the cat? Otherwise, Saturo would be totally disappointing as the main character. We wouldn't believe he had no faults, no insecurities, no fears. But his "perfection" is believable when we're seeing him through the eyes of a cat who loves him. That doesn't mean his perfection doesn't exist. It is the aspect of him that can love unconditionally, the aspect that Nana loves in return. Consider how terribly people grieve for a pet who has died. Many say it is because the pet loved the owner unconditionally. I suspect it's actually because the owner is allowed to love the pet unconditionally. That love and that loss is what this book is about. This book is a mildly charming fable about the power of friendship. It's not much more than that, however. I was hoping I would connect with this book more, being a fan of both cats and Japanese fiction. But this one fell flat for me. 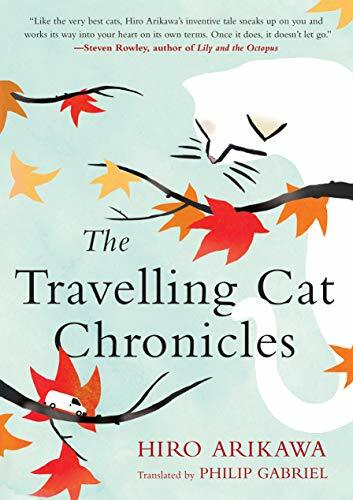 The story follows Satoru and his faithful cat Nana, as they travel around Japan trying to find Nana a new home. Satoru can no longer keep him for reasons that aren't stated (but that you can easily guess). However, as a former stray who converted to being a kept cat for Satoru and Satoru only, Nana is determined to stick by his owner and makes sure he ruins any chance of being left elsewhere. On their travels, they stop to visit with the people who shaped Satoru as he grew up and at each stop Nana learns about a new part of his beloved owner's life. Then their travels come to an end, and Nana shows what true friends are willing to sacrifice to be with one another. While this was a very touching story, it was just an average read for me. I give the author no credit for making me cry at the end; it's just too easy. I didn't enjoy Nana's voice as narrator. There were problems with the translation, using the word tabby instead of calico, stroke instead of pet, chinchilla instead of Persian, ect. I wonder if the prose would have felt less clunky, and the story more enjoyable, if the translation had been better. It will also make you think. I bought this for my wife but I ended up reading it first. This is the story of a man and his cat as they travel thru Japan looking for a new owner for his cat. While the cat is a major character this is not a funny cat story so if that is what you desire do not buy this book, but if you want a thoughtful read this book is for you. I found the book an easy short read and finished it in only a few hours. I read kindle version and had no problems with it. I highly recommend this book. It ends up being a review of the man's life as he visits friends along then way and it also develops that the owner is dying of cancer. He discovers many things about himself and ends up with his aunt, a judge, who raised him after his parents died. Various points of view are brought out in the story both from the owner, the cat and the people he meets along the way. This is a touching, thoughtful, interesting, moving story. 5つ星のうち1.0Sad, depressing book with very little "cat"
First, NOT for kids! I had high hopes for the book, but have been sorely disappointed. It's the story of lonely Japanese men, with a little "cat" thrown in. The "cat" narrative is the best part of the book, but it's meager and and lacking. The rest is all sad, depressing story of deaths, divorces and abusive parents. It's a translation, but still the writing is not very good and the could have used some serious editing. Nana is a street smart cat who sleeps on a warm silver van parked along the street and has the admiration of the owner of that van who puts food out for him. One day Nana is badly injured and drags himself to the van yowling for the attention of the owner. Satoru rushes Nana to the vet and before long Nana is a much loved mostly indoor cat. Satoru and Nana enjoy each other's company for five years and then Satoru takes Nana on trips to see old friends hoping that he can find a new home for Nana. We aren't told why Satoru wants to give away his beloved cat. While journeying to the homes of old friends we learn much about his sad childhood and what a lovely person he is. All of his friends are willing to keep Nana, but Nana has other ideas. He orchestrates a problem with the animals at each home so that he won't be left. Nana, of course, understands Japanese and speaks dog so you hear much of the story from him. (Translated to English, of course). It took me a bit more than 50 pages to get interested in the story--so give it time. Yes, the book is a tear-jerker, but it is a lovely, sweet story that is worth reading.